Reel Good Recipes celebrates Black History Month with films and recipes inspired by great African American actors. Our soulful and outrageously deliciously recipes are from millions of Black family homes, but we always put our special twist on everything! We start February with the film "Claudine" starring the beautiful and talented Diahann Carroll and James Earl Jones. Our first recipe celebration is The Best Fried Chicken Ever! Our chicken will take on any of your favorite carry-out chicken brands. Better taste at a much lower cost. Please enjoy this clip where Claudine and Roop have carry-out chicken rather than the fancy restaurant meal he promised her. Just as her daughter predicted "Its gonna wind up chicken anyway." Add egg, chicken, Season Salt, pinch of salt, Cayenne Pepper, Thyme Leaves, Paprika, and Lemon Pepper to a mixing bowl. Mix well. Set aside. Add flour and Emeril's Original Essence Seasoning to a bowl. Mix. Add chicken one piece at a time. Cover well and shake off excess. Heat large skillet over medium high heat. Add vegetable oil. Heat oil until hot. Add chicken. With a large skillet you should be able to fry 4 pieces without over crowding pan. 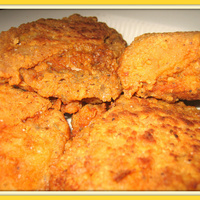 Keep chicken frying over medium heat (don't cook too fast). Cook on each side for approximately 13 minutes, there should be no bleeding. Chicken should be a beautiful golden brown. Remove chicken from pan and drain on paper towel. Have some chicken in the fridge! yes!! This recipe looks very tasty and the photo is great. I will make a point of trying this in the next couple of days, so will let you know how it turns out for me. This recipe was really yummy. We have made the fries several times before making them with the chicken, so the kids already loved them. The chicken was really tasty. It is an inexpensive meal and easy to make. Perfect combination with, http://www.gourmetrecipe.com/recipes/banana-pudding! A must try recipe! Looks great. Though I use less flour in my fried chicken due to being on a low carb diet, but I miss these tasty ways of preparing the chicken. trying it next time i fry chicken. what is and where to buy emerils essence seasoning? I used this recipe for our Sunday dinner using skinless and boneless chicken breasts cut in half like cutlets and the family ate them all and were looking for more. I'll definitely continue using your recipe. Thank you!! It is always nice to try different techniques in preparing fried chicken. I have my own but I could try this too. This is almost how I make it.. I don't use lemon pepper... my grandma taught me. But it takes way more than 4 pieces! LOL! I like it cold also.. Great recipe and will try with the lemon pepper. Debra, the recipe sounds delicious. It sounds really good can't wait to try it!